All sixteen of our cabins are designed and built for your comfort and convenience. 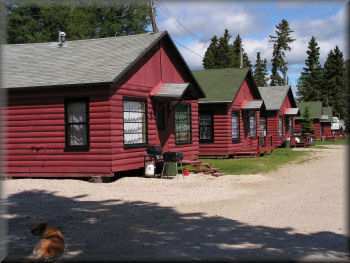 All are modern and equipped with the necessities: hot and cold running water, bathroom with shower, fridge, stove, bedding, hand/dish towels, cooking utensils, pots/pans, dishes, silverware, coffee maker, toasters, microwave, propane/electric heat, and propane BBQ's (propane provided). You need only bring your personal belongings, towels, fishing and/or hunting gear. Our cabins range from 2 to 4 bedrooms, sleeping anywhere from one to twelve people. Most of the cabins are only a few steps from the lake with a beautiful view to enjoy over your morning cup of coffee or late evening get together. This is truly a well established camp with all the facilities and conveniences right here to make your stay an enjoyable and memorable one. If your looking for a place to book your next fishing trip, a place to go to shoot that trophy black bear, or for a place to spend a night or two, we hope you choose Viking Lodge. Please call or email today to book your next trip!